To pre-empt a torrent of emails, we don't currently know if this will work in a R50 or R50e. In terms of the electronics it should work fine, but whether you'll be able to actually get the case closed again once its installed, we don't know as so far we haven't tried it. 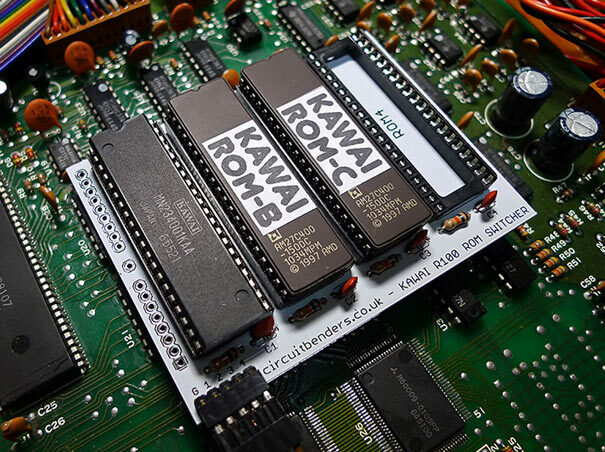 The Kawai 'R' series of drum machines all share interchangeable sound ROM chips, which means the ROM's can be freely swapped between the R100, R50 and R50e to give each machine the sound set of any other. Theres also a mysteriously rare R50-III version that might have only been available in Japan, but we've never seen one and have no idea which sound ROM it uses. Our solderless Kawai R-ROM kit lets you install all three standard sound ROM's in one machine and switch between them freely. It also has a space for a fourth ROM in case you ever come across a custom sound chip, or one from a R50-III. The sound set is selected using a rotary switch on the front panel. Sounds cannot be individually selected and mixed between separate ROM's, so you have to use the whole R100 set, or the whole R50 set etc. 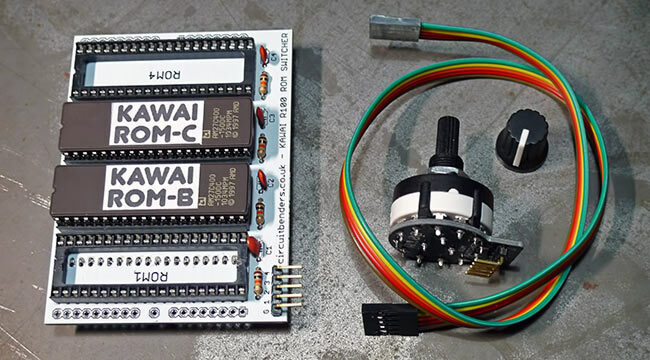 The kit includes the ROM switcher board, a rotary switch mounted on its own custom PCB, a connector cable, and TWO sounds ROM's already installed onto the board. By default these will be ROM-B and ROM-C, as the R100 uses ROM-A as standard and you will probably already have this ROM installed. 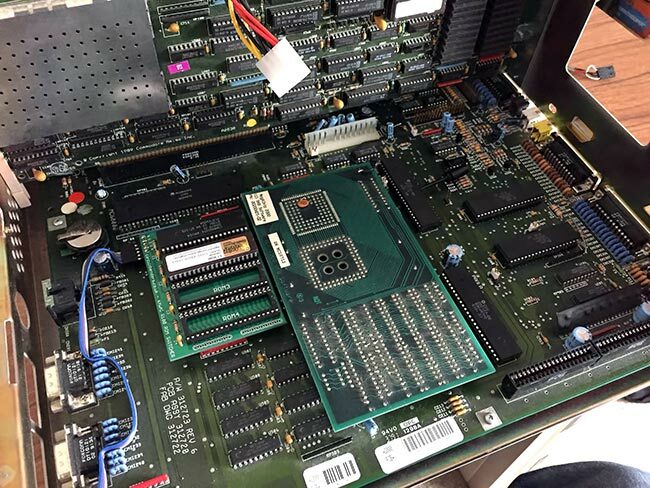 This ROM will be removed from the main board and added to the space on the ROM switcher board during installation. If you don't have ROM-A in your machine, just add a message to your order at the checkout stage saying which one you already have, and we'll supply a switcher board with the other two installed. Please make sure this is a message at our checkout page, and not in Paypal. 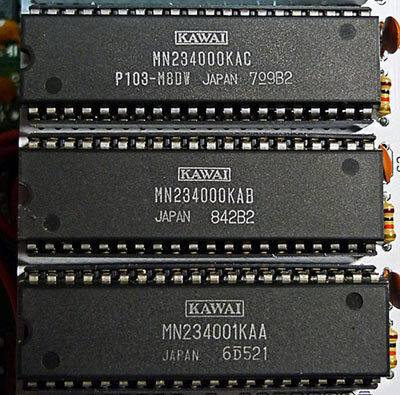 The three standard Kawai R series ROM's are shown to the left. You can identify which ROM you already have from the letter at the end of the middle row of characters. From top to bottom the chips shown are ROM C, B and A. The R100 had ROM A as standard, the R50e had ROM B and the R50 had ROM C. These were sometimes known as CP1, CP2 and CP3 respectively. The kit can be installed without doing any soldering, although you will need a drill. You should take the same anti-static precautions when handling the sound ROM's as you would when handing RAM for a computer. The video below shows the R-ROM switcher installed into someones R100. It also demonstrates just how much the Kawai R series were used on virtually every early Ministry / WaxTrax! records release! On the left and right side of the board there are a number of empty solder pads. These are for easy access to all the points we use for the patchbay connections in our Kawai R100 percussion grinder patchbay mods. Wire them up to some kind of patchbay or switching matrix, and you can produce filthy 12 bit percussion noise like you've never heard before! We are reliably informeed that this can alos be used as a Kickstart ROM switcher for Amiga computers. Below you can see a photo of the switcher installed in an Amiga A2000. While we have been assured that this works perfectly, we haven't tested it ourselves so we couldn't make any guarantees on that. Electronically theres absolutely no reason why it wouldn't work, but whether it would physically fit into your specific machine might be a different matter. If you're interested in buying a switcher kit without the Kawai ROM's installed just get in touch and we'll see what we can do. If you want to buy a board click on the Buy Now button below. Payments are processed via Paypal, but you can pay using a credit or debit card without having a Paypal account. If you want to pay using some other method, please get in touch via the CONTACT page.